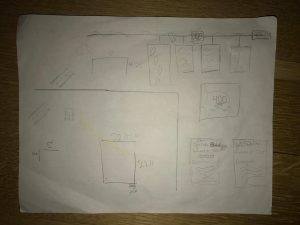 My earliest idea for my book was to create an interactive gallery for my block. Essentially, it would be a rope that goes around the perimeter of a rectangular classroom, and as a viewer progresses through the gallery, it will be as if the viewer is walking around my block. As seen in the sketch, my idea was to have a picture of a landmark and next to it, write a description of whats there, its characteristics, and something interesting to look out for. Also seen are dimensions of the classroom which the rope would have to be long enough for. This sketch was later on voided and my whole project changed. 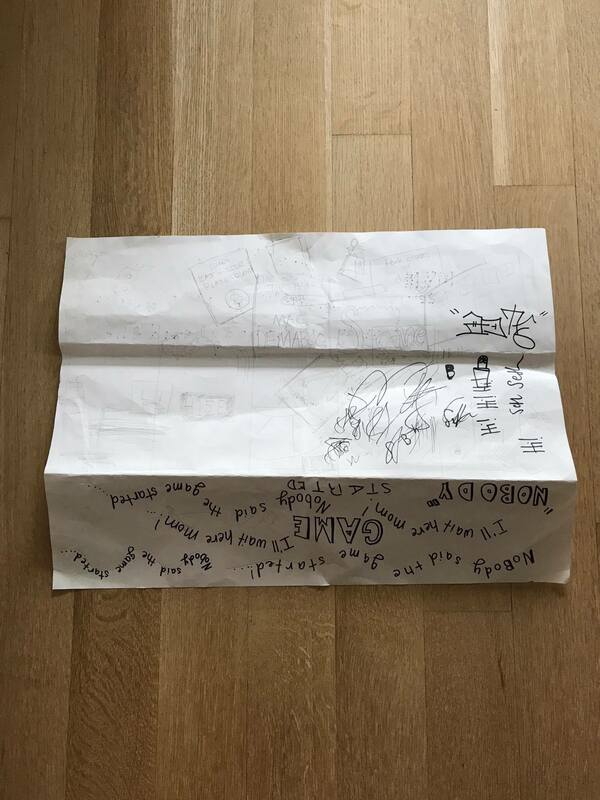 I purchased a skateboard quickly after my initial sketch of the interactive gallery in hopes of coming up with a better idea for my final product. In my thoughts, I had the idea of creating a montage on a skateboard that incorporated my findings on my block, also known as my “lists.” Moving forward, it was time for me to let my ideas flow and record those ideas so that if anything was interesting, I could potentially include it in the final product. 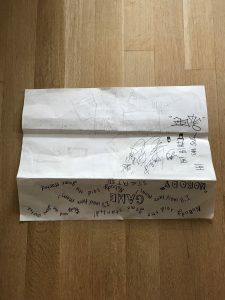 I previously read an article that suggested having one large of paper that I could jot and sketch as many things as I could without having the need to organise my thoughts. Apparently it was a great strategy to create and find what I truly wanted to do within me. The picture above is exactly that. It was one extensive mess but thankfully it ended up being the start of something I genuinely loved creating. As reflected in the sketches, I was practicing the idea of creating a montage. I was doing this by creating drawings that are in conjunction and stacking drawings on top of each other. 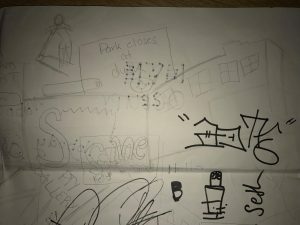 Many of the sketches on the large drawing pad were used in the final product like the building and Supreme graffiti seen in the image above. All these sketches were done spontaneously and as I stepped back and looked at the drawing pad when I felt like it was enough, I was undoubtedly excited to start putting the final project together. 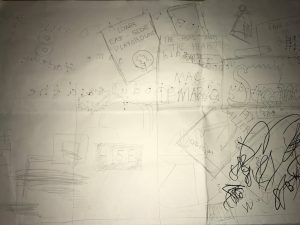 In this first step of sketching out my final project, I hit many blocks simply because I couldn’t capture what I wanted to express creatively in one piece. As reflected in this sketching phase, I started out with a piece that was large and complicated, but later on, ending up with a solid idea for me to start working.